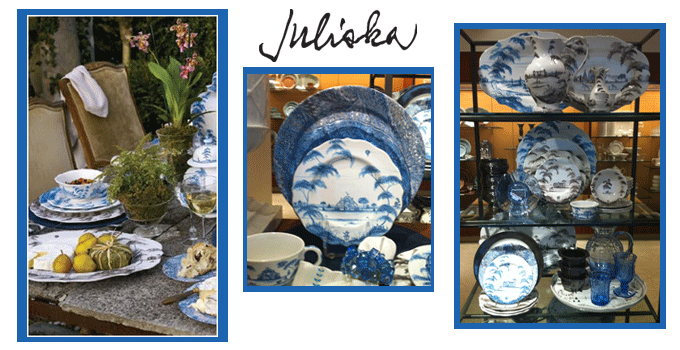 Blue Country Estate Juliska Has Arrived!! I took a day off last week and made a quick trip to Dallas in between school drop off and pick up. Over the years I have become very adept at this little ritual of sorts. To me, it is an easy renewal of inspiration!! I live an hour and a half south of Big D and every now and then, I heed Diana Vreeland’s words ~ “the eye has to travel”. I think she meant farther than an hour and half away. However, I’ll take what I can get. One of my favorite haunts is the home decor floor of Neimans. A friend of mine works there and she asked last week if I had seen the latest Juliska dinnerware, Country Estate in blue. It can only be pre-ordered now and is still in production in Portugal. In fact, Neimans only has the samples from the showroom. Being a huge fan of anything blue and white and Juliska, I love it. These are the only samples in the country, so you can truly say you saw it first on Hadley Court!! Sarah Aynesworth has been teaching etiquette for 16 years. What started as an avocation after leaving the teaching field has eventually become a vocation that has taken her many places and opened many interesting doors. She holds a degree from Baylor University in Education and has attended training courses in the field of etiquette with The Protocol School of Washington, The Emily Post Institute and The Etiquette and Leadership Institute. What she enjoys most about her job is helping others learn skills that will last them a lifetime and boost their confidence. Great post- blue and white is always a winner in my book. Yes, David. You can never go wrong with blue and white!